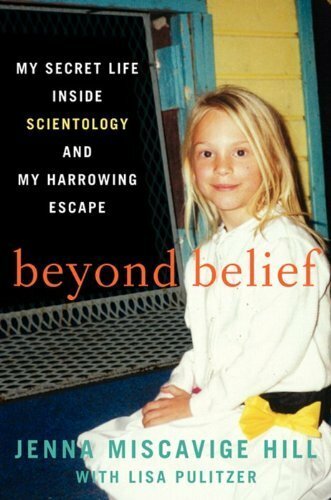 The full title of Jenna Miscavige Hill’s book is Beyond Belief: My Secret Life Inside Scientology and My Harrowing Escape. Hill is the niece of David Miscavige, the head of Scientology who is often mentioned along with Tom Cruise in articles about Cruise’s involvement in the cult. The full title is telling, as much of Hill’s book talks about the systemic secrecy and brainwashing that goes on within the non-public side of Scientology. It is a very strange and frightening organization, and this book is very revealing. Hill grew up in Scientology, as her parents rejoined the Sea Org, an insider’s organization within the church that seems to basically run the entire church, which is in essence an enormous business. Sea Org members, including small children, sign contracts with the church giving their life over to the organization for a billion years. The brainwashing begins even as the children are tiny; Hill and her older brother are basically left to raise themselves with the help of Scientology staff and schools while their parents are sent off to different parts of the country to work for Scientology – Hill was two years old when her family rejoined Sea Org. She and her brother basically lived alone in an apartment until moving to a run down ranch a few years later, put to work remodelling the buildings and grounds while learning how to be good Scientologists. Hill was part of this strange world, and seemed to be subject to extra scrutiny and abuse by nature of her family history. After her brother and parents leave the organization, Hill eventually struggles free herself, accompanied by her husband. Children who are brought up in the cult are enormously isolated, although it seems public Scientologists and of course the celebrity members have much different experiences. The children are basically made over into a slave labour force, with minimal education, forced separation from family and subject to mental and emotional abuse. It is appalling to read – these children are mistreated and I have to assume that their parents know and understand what is happening to them, particularly since the adult members of the cult seem to be treated in much the same way. Hill writes clearly and in a matter of fact manner, and I suspect she demonstrates some remarkable restraint in terms of providing telling details about people within the cult and some of the abuses perpetrated there. I am baffled about why public Scientologists, who are not as sheltered as inner member are, can continue on in this organization as some references to the abuses must be available to them. Groups like Anonymous and ex-members like Hill are certainly doing their best to bring these out into the light, and the information in the book makes it even harder for me to appreciate celebrities in the cult – it is willful blindness, shameful. I am honestly unsure about why Scientology’s programs are legal in the Western world at all, and I found this book enormously disturbing. I admire Hill’s courage in telling her story and efforts to bring light on this really appalling situation, and hope her friends and family still within Scientology are able to free themselves one day as well. I was not familiar with Ellen Forney’s work prior to picking up this graphic novel on a whim at the library, but Forney has a written and illustrated a few other books, and discusses some of her work in the novel as well. I was a bit uncertain about how much I would enjoy this book given its subtitle, as I have been struggling a bit with depression and anxiety myself lately. Escapist reading generally doesn’t include some in depth examination of your own problems, generally, but this was great. 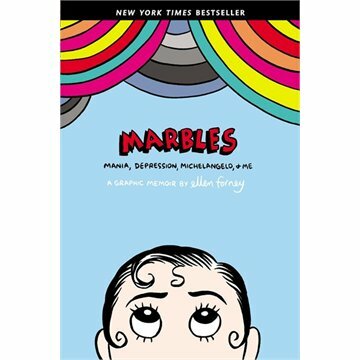 In Marbles, Forney writes and illustrates her journey to balance after being diagnosed with bipolar disorder. She struggles throughout to reconcile her health issues with her creativity – she worries that medication will dull her creative impulse and alter her personality. Forney gives a lot of detail about her efforts to find the correct medication and treatment plans, how her illness affects her career and also her personal life to some extent. The book itself has a lot of variety in its illustration – much of it is illustrated by Forney in a comic style, but there are also some photographs of pages of her journal and several lists. She provides some background information on the costs of treating mental illnesses, and also summarizes some research about famous artists and writers and how their struggles influenced their work. She writes with a lot of honesty and forthrightness, presenting her struggles in kind of a matter of fact manner without being overly clinical. Despite it being such an intensely personal story, there really isn’t any sense of a “woe is me” attitude about it – that might be partly a result of the perspective that comes from years of balance after finding the right treatment, but she just generally seems to be well adjusted about the whole thing. Marbles was wonderful – enjoyable and relatable, just a great read . I have to admit I love William Steig – I think his illustrations are clever and his children’s books are charming and intelligent, particularly Shrek, Pete’s a Pizza, and Sylvester and the Magic Pebble. In truth, I have recently read Sylvester to my children and it brought me to tears – that is a much different story when you read it as an adult with children. I did not really know Steighad done much work for adults until I came across this beautifully bound and designed book. I think I was too young to have seen any of those when they were first published, and The New Yorker was never really in my cultural sphere anyways. 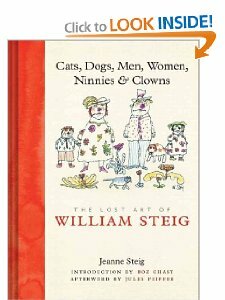 This book consists of loosely themed chapters of Steig’s unpublished drawings in various stages of completions, accompanied by interesting and person introductions to each set by Jeanne Steig, his last wife. These chapter introductions are really great – they don’t present Steig as a perfect person. He seems rather prickly and introverted, and it does not seem as though his marriage was an always easy. However, they do seem to show him as a person who is an observer, interesting and interested in life and with a great sense of humour. I think I am going to see if there is a more formal biography of this author and artist. The art itself is quite varied – much of it seems to be earlier rough drafts of work that would be published (or at least submitted). While the style of drawing is recognizably his own, Jeanne Steig talks about how he experimented with colour and pattern as he moved throughout his career. Perhaps I am not a particularly observant person, but I hadn’t really noticed that progression when first browsing the book, so that was a helpful thing to have pointed out. Like many people, he seems to have more sympathy for pets than he does for their owners, although he carefully points out how many people and their pets come to resemble each other over time. This book seems to show his appreciation for the outlandish, and a certain slyness in poking fun at people and their general ridiculousness. It is just a lovely book, and I was so pleased to have run across it.